Although it was the last track written for the album "Watermark" it was the first track to be released, and with great success. There was a sense of discovery in the creating of this album, a sense of beginning, a sense of something new and exciting. “Orinoco Flow” reflects the feeling of that time for us – adventure! Enya: "…it is true that we had it shelved a few times and it was a very difficult song to work on. We would work on it for a while, forget it, go back to it but, again, because we had the time, which is important to point out, we were able at the end to listen to it and say ‘this is good.’ But all the time it was an album track and at the very end it was only decided that this might be good as a single. But even then, as singles go, it’s very different." 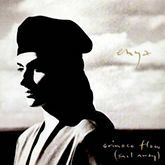 Enya: "Orinoco Flow, those, it started from the sound, from the pizzicato sound, and it was Nicky that said “This is great, let’s compose a piece of music with this sound.” So we put down a chord sequence, we built it up with the vocals, the hundreds of vocals sung in free time, and then we came to, the first section we had was the chorus, and it was “Sail away, sail away, sail away…” So the verse happened last. And when Roma was doing the lyrics, she thought the “sail away” was so positive that it would be nice to relate the whole song to someone sailing all over the world. So Nicky said, “That’s a great idea,” but he said the rhythm reminded him of a children’s skipping song, and he said to her, “It would be nice if each port or river or place had a rhythm in it, or else it rhymed.” So hence, the “Or-in-o-co Flow” or “From Bali to Cali, from Peru to Cebu.” Basically, we worked on it as a fun song. 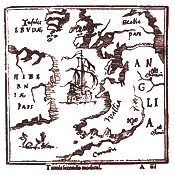 (..) Roma made up a few places, like The Island of the Moon, and the Isles of Ebony. That’s her daughter, Ebony. So some of the places were made up, very romantic places." Enya: "One of the big influences is from the producer, Nicky Ryan. His musical influences are from Phil Spector, you can hear "The Wall of Sound" and the Beach Boys, so his intention was to build up a big sound around that melody." Roma Ryan: "With ‘Orinoco’ it was a case of me coming out to the studio to listen, to the pizzicato and while I was listening to it I was looking out the window and I could see my two children skipping, and that’s actually what sparked off the idea for ‘Orinoco’. It’s to do with imagination, it’s a journey of the imagination…"
Rob Dickins: "Nicky Ryan sent over what became Orinoco Flow. There was no middle eight, and ‘Sail away’ was after every line – it drove me crazy, but there was something there that could be worked on. Orinoco was the name of the studio and I think they saw me as the captain of the ship. The whole thing was a metaphor for a journey for all of us. (..) It’s one of the things I’m most proud of. Funnily enough, I hadn’t even noticed the lyric until they printed the album. It was embarrassing. But when it went to number 1 I thought, ‘I’m in the lyric of a number 1 song, how fabulous.’ All these years later, if I heard that line ‘Rob Dickins at the wheel’ I can’t help smiling." The song climbed to no.1 in the British, Swiss, Dutch and Irish charts. It stayed at the top of the UK singles chart for three weeks. The name of the song refers to Orinoco Studios (now Miloco Studios) where it was recorded. The lyrics also mention Rob Dickins, who was the CEO of Warner Music UK at the time, and Ross Cullum, who was the album’s engineer and co-producer. The song was initially released as ‘Orinoco Flow’ but because people kept asking for ‘Sail Away,’ the later pressings of the single feature the title ‘Orinoco Flow (Sail Away)’ on the cover. A 12" ‘Orinoco Flow’ picture vinyl disc was included in the collector’s edition of ‘The Very Best of Enya.’ The vinyl features the picture of the original single cover without ‘Sail Away’ after the title. 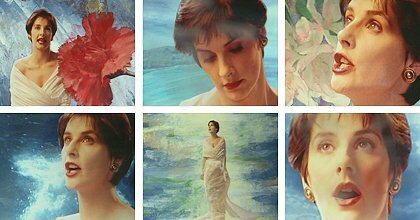 The video, directed by Michael Geoghegan, features Enya in a painted flowery landscape. Enya: "For Orinoco the video came from the cover of the album, Watermark, and basically it’s a picture of me but there are layers and layers of imagery that were hand painted on to the cover. And what we wanted… we were so happy with this cover… what we wanted was an extended version of this for the video that was of me but there was this beautiful imagery revolving around me and this is what we achieved with the video. And, I’m quite happy with this…"
Enya: "I worked with a director named Michael Georgehan, and I spent just one day with him, believe it or not, and I was shot with just the blue backdrop, and then he went and spent five weeks with four artists, where they hand-painted a lot of the imagery with me, and I must say I was pleasantly surprised by the end-product.